Working in Manitoba tourism for 10 years and being a mom for almost 6 of them, I’m embarrassed to admit that until last summer, I hadn’t heard of Lilac Resort. We were heading down Highway 1 on a summer adventure last year, when there it arose out of the horizon, all sparkling blue pools and thatched grass roofs hinting at a tropical paradise, right smack dab in the middle of the prairies. I knew I had to go and when the opportunity presented itself this summer, I jumped at it. Arriving at Lilac with my family in tow, it was clear I was one of the few that was unaware of its existence, because on that hot July day at 10am, it was already bumping with activity. 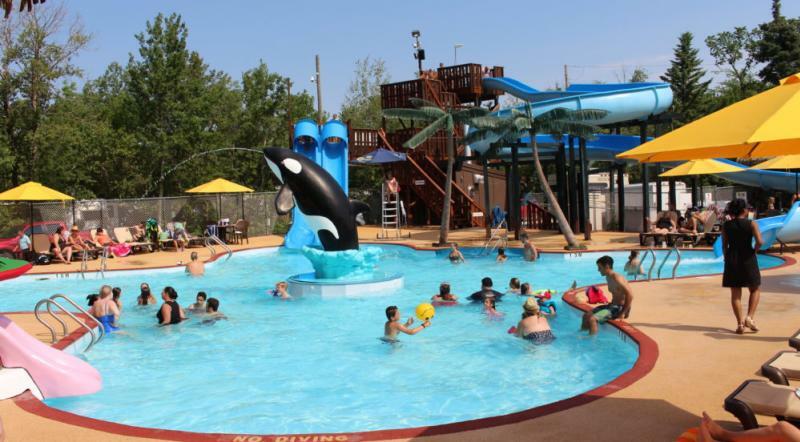 The pool area offers three different versions for different ages and levels of activity. There was a wading pool for little kids complete with a slide, spray features and a nice soft surface for little feet to walk on. Another pool (where older kids were hanging out) offered two fast slides, deeper water, basketball hoops and a ‘walk on the water’ obstacle course. My favourite pool was the largest. It seemed to have something for everyone. Racing slides, a water spitting whale, a frog slide for kids and a winding three story water slide that my 2-year-old convinced me to take him on. After he plunged into the water with me at the end and I lifted him out, he shouted ‘again’! I couldn’t agree more, kid. There are tons of comfortable and cozy places to sit and relax throughout. We were lucky enough to snag the gazebo (it can be booked out for $30 extra and is extremely popular, so call early), which offered us poolside views and shade from the sun. Note: the kids are all crowded around the table and I couldn’t get anyone to look at the camera because a bag of chips had just been opened. Beyond all this, Lilac Resort also had DJs, entertainment and games going on throughout the day. They also have a campground for tents and RVs, cabins you can rent, events all summer like Christmas in July, Halloween in August, trout fishing and even fireworks. Check out their complete list of events. Clearly, we could spend the entire summer here and never get bored. At the end of the day, my family all agreed we’d be back–and soon. Head 20 minutes east of Winnipeg, right off the Trans Canada #1. From June to September, water park is open 10am-10pm daily.